Planeetta Review 2019: Is Planeetta a Good Hosting? Finnish company Planeetta is one of the leading Northern European providers of web hosting, servers, WordPress websites and maintenance, domain names, e-mail services, and e-commerce solutions. Helsinki-based Finnish company Planeetta was established in 2002. It offers an extensive range of services including the Jelastic cloud platform, hosting, file servers, WordPress website design and maintenance, domain names, and e-commerce solutions. 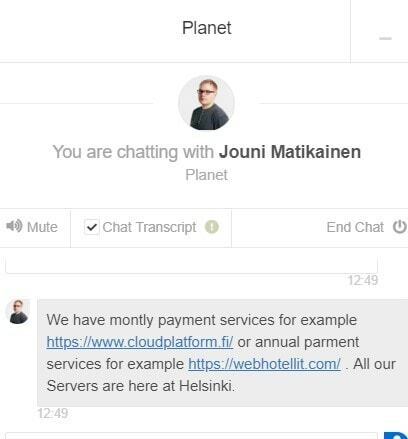 Using its Finnish data centers and public clouds, this provider maintains and monitors the online services of more than 15,000 Finnish corporate customers. Its website is in Finnish, but there is a “Briefly in English” page which is exactly what it says: a few simple sentences in English giving basic company information. 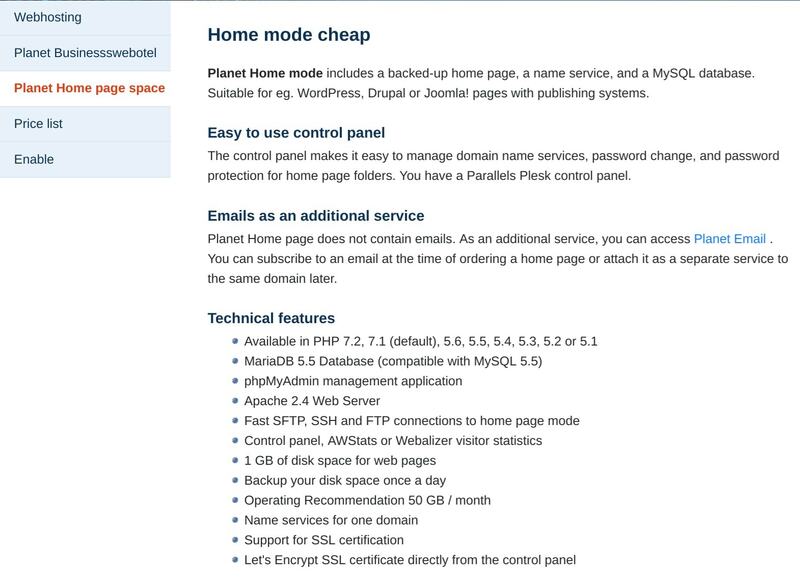 For beginners, Planeetta provides Planeetta Kotisivutila (or the Home mode plan) that includes a name service, a backed-up home page, and a MySQL database. From a Parallels Plesk control panel, you can manage password changes, domain name services, and the home page folder’s password protection. Although this plan doesn’t come with email included, email is available as a paid extra. For businesses, Planeetta provides Planeetta Yrityswebhotelli (or the Business plan) that comes with 1 GB space, 5 Planeetta mailboxes (with Exchange ActiveSync enabled), MariaDB, PHP7, SFTP, FastCGI, and AWStats. Although Planeetta offers daily backups (presumably for its own disaster recovery purposes), backups of files/data/documents for rollback purposes are the customer’s responsibility. Planeetta also offers scalable Linux and Windows servers, e-commerce services to build a customized online store with the requisite software features, and merchant tools for e-commerce maintenance and trading. This provider’s Jelastic-powered cloud platform allows you to transfer your applications seamlessly to the cloud without any code changes or bulky API documentation, and its WordPress website design service will build you a mobile-responsive and search-engine-optimized website with user-friendly page management and visitor tracking. The beginner-level Planeetta Kotisivutila package is competitively priced, which is good news for anyone looking to get started with an online presence. But beware that you need to add 24% VAT to the published prices. As is usual for hosting providers, monthly prices are shown, but you can only purchase plans (in euros) on quarterly, yearly, biennial, and triennial billing cycles. With Planeetta, you get no money-back guarantee. You also get no trial period by default, but the company’s “General Terms of Contract” page indicates that a customer can negotiate with the company and agree on a trial period for a chosen service. If you’re looking for a Northern European provider of competitively priced shared hosting plans, you should plan to look at Planeetta. Finish your search for hosting with Finnish host Planeetta. Wondering how Planeetta stacks up against other Web Hosting companies? Enter any other Web Hosting company and we will give you a side-by-side comparison.